“Maybe you might be interested in offering a workshop for our Project Week at the end of the year,“ the principal of my boys’ school told me. We were meeting for the first time to talk about various things, and the subject of games, game design, and my previous experience with youth and children came up. Several months later, I was given a classroom full of 15 students from grades 4-6 (9-12-year-olds) with 4 days to teach them how to design games and give them the materials to do so. I was also given a classroom with a very cool Smart Board, and was excited to finally be able to use one. Each day, we had the full 4 hours from 8 a.m. until noon to learn, play, design and build. This was both exciting and a little scary. I had never had so much time with such young students to teach them about game design and help them design their own games. Would it be too much time to fill? Would they eventually lose interest? Could they stay focused enough to get some games finished in time for the presentation afternoon on Friday? On Tuesday, I met the class. I was pleased to see that it was almost perfectly divided between the 3 grades, and also between boys and girls. I introduce myself briefly, showed them several prototypes of mine that were eventually published, then showed them the published versions. I asked them if they thought that they could design games too. Then I showed them a wonderful German television feature about the Brand family. The husband and wife team of Inka and Markus have become one of the most prolific game design teams in Germany during the past 5 years, and their young children have followed in their footsteps with two published designs of their own—one of them even winning the German Game Award (Deutscher Spiele Preis) for best children’s game! I then asked each of them to introduce themselves with two bits of information: name, and favorite game. Surprisingly, even in Germany, most of them answered the second question with either Monopoly, Risk, or Mensch ärgere dich nicht! (their version of Sorry! or Parchisi). One 4th grade girl named Hannah was the only one to list The Settlers of Catan among her favorites. Every game has at least one of these elements, I said, and most games combine varying degrees of at least two of them. It was then time to give them a quick introduction to the different types of games out there. I thought that it would be good to expand their minds beyond the “oldies” that they listed as the only games they knew. If I was to teach them how to design modern board games, then they needed to be brought up to speed. After all, we were using a Smart Board in the classroom, and they were still playing Monopoly! I divided them into four groups to play Bamboleo, Packeis im Pol (Hey! That’s My Fish! ), Heckmeck am Bratwurmeck (Pickomino), and 6 Nimmt! (Slide 5). When some of the groups finished early, I pulled out Diamant (Incan Gold). I selected these games because they were all quick to teach and play, and provided a relatively broad spectrum of modern games. Bamboleo was the the dexterity game, Hey, That’s My Fish was the pure strategy game that also utilized tiles, Pickomino was the very original dice game, 6 Nimmt was a great example of a very different type of card game, and Diamant was an original but simple “push your luck” game with attractive components. Afterwards, we discussed which of the 3 elements—and to what degrees—each game possessed. Then, the students gave feedback about what they liked and didn’t like. – Bamboleo did not go over well with its group because they really had a difficult time balancing the plate of objects during set-up, and it usually tipped over too early in the game. – Pickomino was boring, the students said, because you were doing the same thing over and over and had to wait quite a while before it was your turn. – The boys who played Slide 5 liked it quite a bit, especially when the cards unexpectedly penalized their opponents, which generated a lot of groans and cheers. – The group who played Hey, That’s My Fish! liked the simple but thematic rules, and the tactics that made you think without making your brain hurt. The game was fun to play, they said, but not enough that they necessarily wanted to play it again right away. – Diamant was an instant hit, and the only game that they continued to pull off the shelf to play over and over during the week, whenever they wanted to take a break from their own designs. It’s really shame that Schmidt Spiele in Germany has let this one go out of print, and it’s nearly impossible to find even a used copy anywhere here. We also discussed the components that each game used: game board, cards, dice, tiles, figures, and specialty pieces (wooden blocks, money, chips, gems, etc.). Next, it was time to talk about game design and how one might go about making a new game. I admitted that at least some of the building blocks used in every game have been used before. Like notes in a piece of music, however, they can be recombined endlessly into new works. Sometimes, it’s helpful to start by making modifications to games we know well. I took out a little cloth bag and had the students push the desks to the side so that we could sit in a circle in the middle of the room. Then I announced—to plenty of groaning and eye rolls—that we were going to play Der Plumpsack geht rum, a well-known children’s game that is akin to our Duck Duck Goose. “You don’t want to play a game you played in Kindergarten?” I asked. “Fine. Let’s change a rule to make it more exciting to you now.” Every round, we changed another rule. The students suggested new ways of moving around the circle, different ways of placing the bag so that it might be more difficult to detect, and many other variants. We even had the beginnings of a deduction variant. Even better was to listen to them brainstorm ideas and then debate their viability with each other. 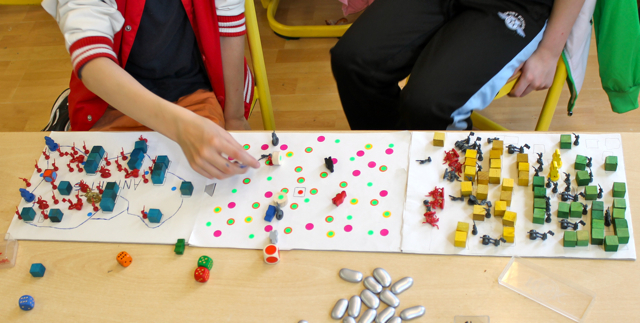 Playing a simple children’s game turned into a real problem solving-session—similar to the process of board game design. Next, it was time for another short, grade-school-level lecture on my “Vitruvian Triangle” of game design: theme, rules, and components. The theme, I explained, can be an inspiration to the designer, a device for internalizing the rules for the players, and something that also immerses them in the “story” of the game. I had each of them write down one or more themes that they were interested in. The rules, I continued, are the goals and boundaries of the world you are creating with your game. You are much like an author writing a story. You write the first chapter: the setting or starting position. And you write the last chapter: the goal and how it ends. The players, however, are given the freedom to write the rest of the story, albeit within the framework you have give them. The way they play the game—how they face the challenges of the game and those posed by their opponents, and how they overcome obstacles and reach the goal—is different every time in a well-designed game. I had each of them write down a possible goal for their game. Then they were to write how the game started. Finally, I emphasized the importance of player decisions and interaction, and had each of them write down some decisions they wanted the players to be able to make, and how players could interact—positively or negatively—with their opponents. The components, I added, were usually the last thing to be considered, unless the game had a strong dexterity element. There are standard components, of course, but one can also use just about anything in a game. In fact, one does not need fancy components at all for a prototype. I showed them my bag of multi-colored plastic bottle caps as an example, and I also distributed bags of wooden bits and collectible card sleeves for each of them to use for their own designs. The remainder of the day was spent beginning their game designs, and I tried to make it to each desk before lunchtime. Some of the students formed groups to work on a single game collectively, while others preferred to work alone. I was very impressed by the students during the day. They were attentive most of the time and it seemed that the biggest distractions during my short lectures were when they had ideas for their games and couldn’t resist writing them down or whispering to each other about them! On Wednesday, I showed the students a 30-minute video on the subject of games that a German television program had done, which included a segment interviewing me and showing every step of my design process, from research and prototyping to playtesting at the Spielwiese gaming cafe. Then they got right to work on the designs, and I began my “tour” of the tables. There were 9 game projects in progress between the 15 students, and the most challenging part of leading the workshop was trying to make myself available to all of them. Still, this was the part that I enjoyed the most, seeing the excitement in their eyes as they turned their creativity loose. It was fun to be able to encourage them in their work, but I also did not shy away from challenging them to remember what we had talked about the previous day. In particular, the inclusion of meaningful decisions in a game was difficult for most of them to grasp. They had plenty of ideas about how players could get from the beginning to the end of the story, but it was all very deterministic, usually decided by die rolls and randomly drawn event cards. It made me realize again how difficult this area is for any designer, no matter what age. Random elements are part of most good games, but making sure players have ways of mitigating these—or minimizing their effects—is so important. Decision trees are also important in allowing the players room to play creatively within the game system, the freedom to write the story of each game. Most of my work in guiding them with their designs was in helping them create those meaningful decisions for the players of their games. Of course, when teaching children, it is a thin line to walk between the extremes of allowing them to do whatever they want and taking complete control of their work. I tried not to change their prototypes into something I would want to play, but at the same time, I wanted to at least help them see what they would want to play over and over again. In the end, they were able to keep many of the random elements in their games, but I helped them find ways that players could both prepare and react to these, as well as giving them different ways to reach the games’ goals. One of the other issues, which is problematic for designers of all ages, is that they had so many ideas it was difficult for them to filter them all. I often found myself asking them, “What is the core idea of this game? What is the thing you like to do the most when you play this game? “ Then I challenged them to eliminate the elements that had little or no relationship with the core concept. For example, one team had made several decks of cards with quiz questions and funny activities to complete, but they had also made a board with so many other spaces that forced player figures to go forwards and backwards, and it was all connected to a die roll. The core concept of the game was the cards and the fun in answering questions and doing silly activities (or watching the opponents doing silly activities). “Why make a board that keeps you from drawing and acting out these cards?” I asked. Additionally, they had an intricate monetary system along with roadblocks that could be “bought.” This, too, distracted from the main goal of their game. It’s quite natural for any designer to put every idea into that first game, especially when it’s a one-week school project, but I think it was also good for them to be challenged to focus, and it was a reminder for me to focus in my own work as well. On Thursday, the students were ready to learn about playtesting. Each one wrote the name of their game on the top of a sheet of paper with the word “Commentary” underneath. Then I encouraged each of them to play the games from their classmates and write what they liked and what they thought could be improved. The students enjoyed playing each others’ games, and it prepared them well from the presentation afternoon, when all the other students from the school (grades 1-6) would visit over a two-hour period, and I would need plenty of demoers! The remainder of the time on Friday was spent adding more art to the game boards and cards and, in the case of team projects, in creating multiple copies of the games so that each team member could have one. Then the other students poured into the classroom, and I enjoyed seeing them fill up the tables of my students. Parents and schools are a little more careful about allowing pictures of their children these days, so I did not take any of the students themselves. But I will always have a “photograph” in my mind of their proud faces as they taught the games they had made during the week, first to the other students in the school, and then to their parents. 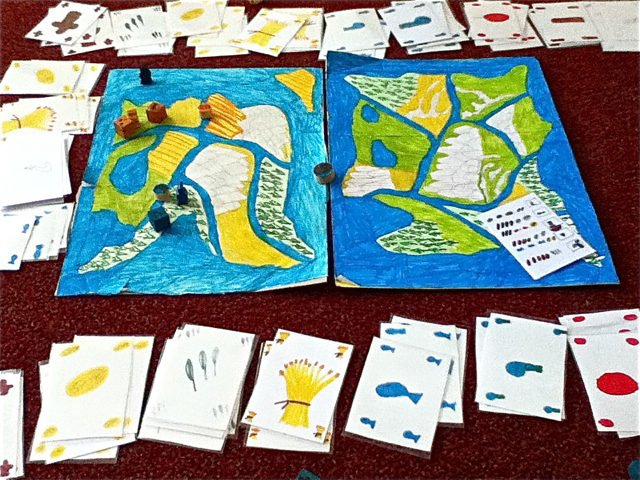 A 4th grader designed this Roman-themed resource-collecting and building game. 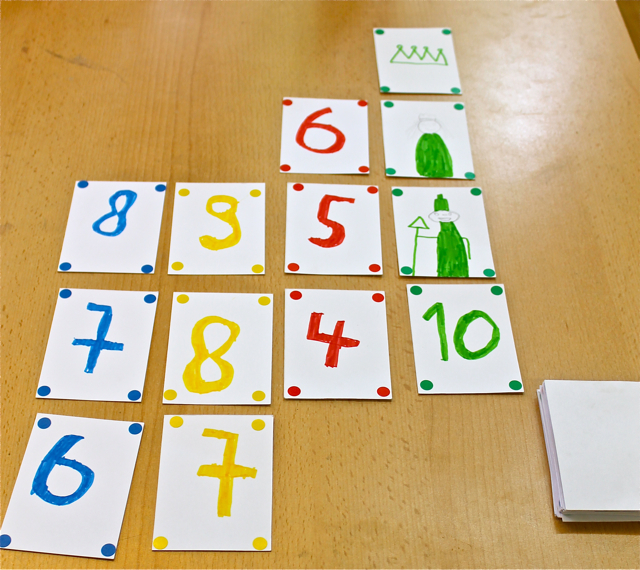 A simple card game using ascending and descending numbers. 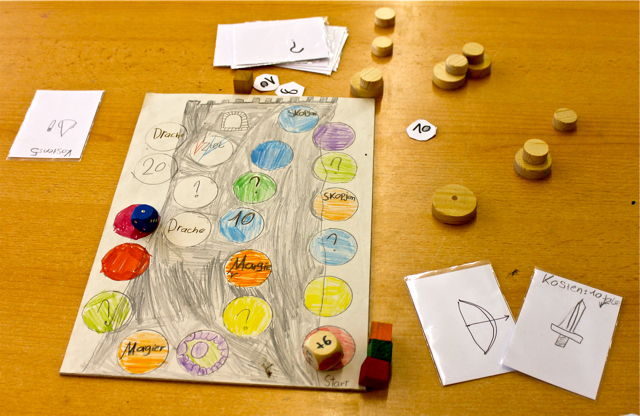 Based on a short story written by the game designer, his game has duel winning conditions: either be the first to use your figure to build a tower in your color, or use your snail to build a house of different colors. 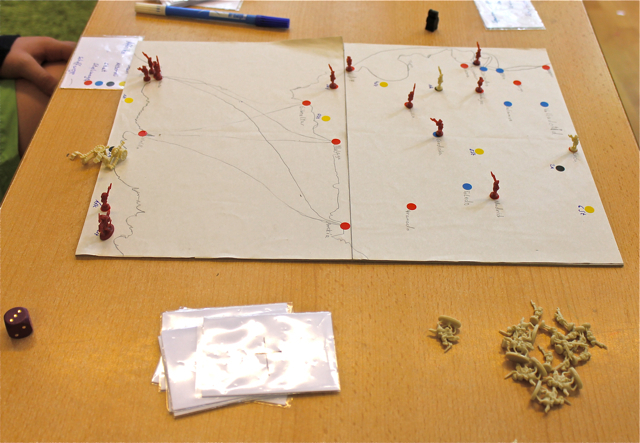 Another 2-player war game prototype using Risk mini-minis. Climbing Rapunzel’s tower requires skill, luck and being able to buy the right weapons. Translated “Find My Stuff,” it’s a bit like a pick up and delivery game. I’m so impressed with the time and effort you put into making that week so fulfilling for those kids. I’ve often thought that such a game design workshop would be a good summer camp idea. I wish I had the time and energy to pull it off. This was a great story to read! I loved reading this story! Thank you so much for sharing it. 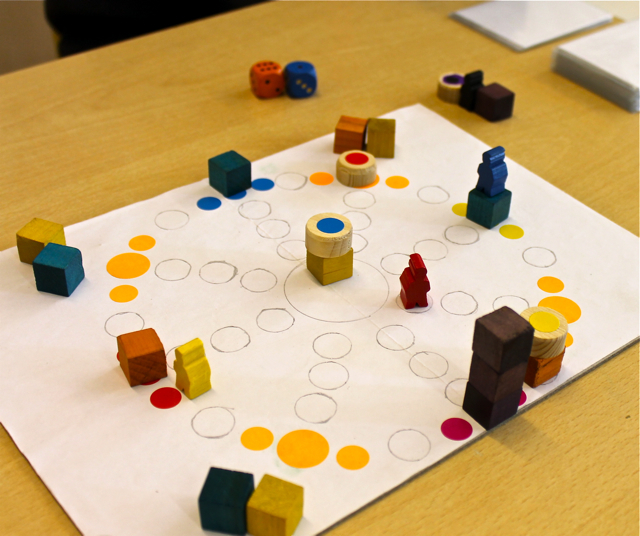 You make teaching kids about game design sound like something I would love to do, too. I found this write up when I was looking for someone who has used games to build creativity and create a fun learning experience for children. Firstly, the experience you have created for these children is simply mind-blowing! I have particularly liked the short story themed and Roman themed game and would love to try them! I am writing to you from Hubli, in the state of Karnataka of India. We are conducting a learning festival for 4th to 6th graders here for 7 days. The learning festival is a space where we elevate and celebrate an experience of learning through various mediums of arts. We hope to build a love for learning for the children. Thanks for this great article. I’m hosting a class in China and found this article during research.